Here's yet another poignant reminder that we still have no idea when a small asteroid could strike the Earth. 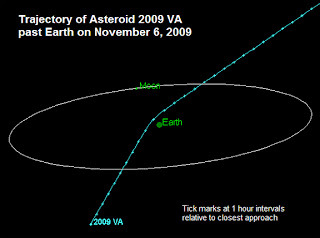 This new asteroid, 2009 VA, has a diameter of just 7 metres so it would have largely burnt up in the atmosphere, but last year a much smaller (2 to 5 metre) asteroid made quite a few headlines as it made its way towards the surface and eventually exploded in the air, leaving tons of fragments for lucky researchers to hunt for. Let's also not forget the obligatory Arecibo Observatory promotion, an observatory uniquely equipped to detect these types of objects. The trajectory of the asteroid shows just what a close approach this was. As for the mass of this asteroid, assuming a density of 3 grams per cubic centimetre that makes it around 540,000 tons, nearly twice that of the International Space Station (303 tons). Asteroids of this size are perfect for one day bringing into Earth orbit to mine, since they are too small to damage the Earth if an accident were to occur but still have a surprisingly large amount of material to mine.